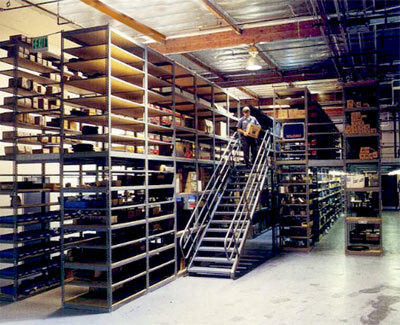 Rivet shelving is made of welded steel posts and shelf beams. The secret behind its sturdy build is in the connectors. The upright posts have tear-drop holes punched at regular intervals, while the shelf beams have button-like connector pins which slide into the tear-drop holes on the posts and, as they fall deeper into the tear-drop, they create a strong hold as gravity pushes the pin against the narrowing tear-drop bottom. This type of connection helps prevent sway and bonds the component parts together, giving the shelving remarkable load capacity and stability. Because of the strength of the connection between posts and shelf beams, and the stability created, rivet shelving load capacity is significant. While wider shelves reduce capacity, center supports and more shelves with less beam spacing between shelves can increase capacity, giving you a lot of options in shelf spacing and in optimizing what you can store in the shelving. One of the more innovative uses for rivet shelving is to make it the structure for a mezzanine. It can be installed atop a structural platform, but can also serve as the structure for a mezzanine project. This concept provides one of the best concentrated storage areas possible. Due to its inherent versatility, rivet shelving can be cut to exacting heights and installed as support structure to fit any need. This allows you to build a simple square of just about any size, with shelving that runs the entire height, in rows on the floor, and in rows atop the platform. This is often done in auto dealership parts rooms, in warehouses, in work cell areas for manufacturing, and of course in distribution operations. Often called “deck over” or multilevel shelving solutions, these systems can double (or even triple) available space by using the vertical cube. 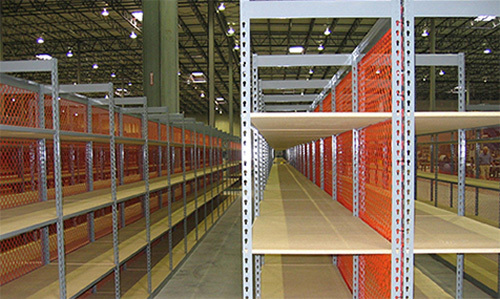 Since rivet shelving allows unimpeded access from all sides, pickers can add or remove stock from either side of an aisle, on any level of the system. If you work with a qualified company that uses OSHA and UBC/BOCA approved designs, your system will meet or exceed fire codes. While double rivet shelving offers higher load capacities and greater stability, it’s more expensive and takes more of your vertical space up. 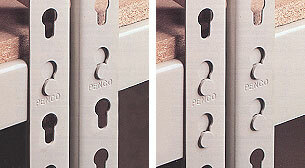 Double rivet beams are considerably larger than single rivet beams and occupy more vertical space between shelves. However, double rivet shelving has greater lateral stability due to dual rivet connectors on each shelf end. Also, you can specify wider shelving and uninterrupted spans of up to 96″ when you specify double rivet, where single rivet goes up to 48″ wide. 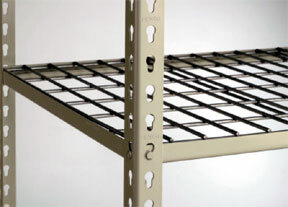 If your loads are lighter, single rivet shelving should serve your needs. For larger loads with heavy duty capacities, double rivet is the preferred option. See Single Rivet vs. Double Rivet for more information. Shelf decking is highly recommended unless stored items will extend beyond the front and back beams when placed on the shelving. Particle board decking is often selected for rivet shelving, but you may also select wire decking that consists of a heavy duty wire mesh that sits on top of the shelf beams. Either of these deck styles are suitable as long as you consider the size of the containers stored on the shelving. Particle board will not allow anything to fall to lower levels, while wire decking allows air flow and fire sprinkler access as well as allowing small items to fall through the decking. Particle board decking also impacts the total stored load capacity because of its weight. With the ease of assembly and disassembly, rivet shelving is an excellent choice when reconfiguration of storage space needs to be easy. Because of its higher load capacities you have open shelving without side bracing, giving you more options in what to store and the sizes of the containers stored.